Senior forward Alaysia Kelly is a two-year starter for the Hall High Lady Warriors basketball team. As team captain, she is leading the team in scoring and three point field goal and free throw percentages. Academically, Alaysia is the 2018 Class Valedictorian with a cumulative 4.0 GPA. She is being recruited by various schools in both academics and athletics. Your LRSD family couldn’t be prouder of you, Alaysia! 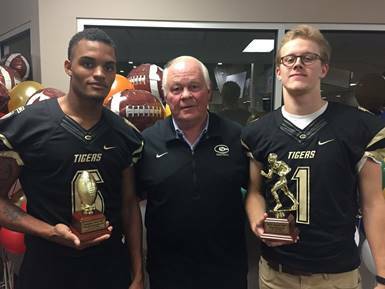 Outstanding teammates – that’s exactly why we have Co-Athletes of the Month in Little Rock Central High’s Jacob Howard and Donald Richardson. They have supported each other and their fellow football players throughout their sports careers, achieving significant athletic accomplishments individually and collectively. Both were honored at the Champions Banquet at Emmanuel Baptist Church. 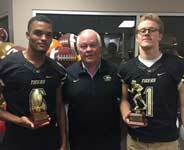 Donald received the Champions Award, based on character and attitude, while Jacob was the recipient of the MVP Award. The MVP award is given to the player who coaches feel was the most valuable player through the year. These young men are both great ambassadors for LRCH and the LRSD. Jacob volunteers at Our House and Camp Aldersgate and plans to attend the University of Arkansas at Fayetteville. Donald is a member of Central’s NAACP Chapter and a Delta Presents honoree. He has scholarship offers from Henderson State University, University of Arkansas Monticello, Culver Stockton, and Franklin Pierce University. 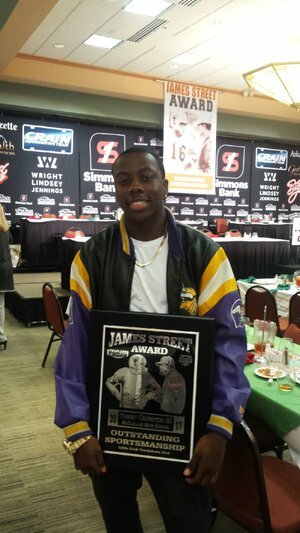 We are proud to announce that this month's LRSD Athlete of the Month, Crimson Lion football standout, Tommy Crumpton, was also named recipient of the James Street Award! The award recognizes a football player who demonstrates outstanding sportsmanship toward teammates, coaches and opponents. Crumpton joins elite company that includes Dominique Scott of Parkview, who received the inaugural award, named in honor of a late Texas quarterback, in 2014. Congratulations to Parkview Senior Zachery L. Smith, named LRSD Athlete of the Month. He is a standout running back and strong safety. Zach as he is affectionately called, had 836 rushing yards on 36 carries for 8 rushing touchdowns at the time of his selection. He also had 6 receptions for 86 receiving yards and 1 receiving touchdown. All this while being active in his community and church. He’s a member of Arkansas Commitment and maintains a 3.025 GPA. For the month of March, soccer is the sport of choice for our Athlete of the Month. Carlos Fabian is a 16-year-old sophomore at Hall High School, and has been a member of the Hall Soccer team since his freshman year. He has made significant contributions toward the success of the team as its first choice goalkeeper. Fabian's goalkeeping skills coupled with his acrobatic moves help him to make saves that have resulted into conceding only 3 goals in three games – hence the team’s current conference standing of 3-0. Not only is Carlos an outstanding athlete, he is an AVID student! Adding to their latest honors, Central’s Girls Swim and Dive Team recently earned the title of 2017 6A-7A State Runner Up. They are also back-to-back 6A-7A Arkansas Central District Champions. According to Triand data, the average cumulative GPA for these 26 girls is 3.86, and 14 of them have at least a 4.0. Several of these swimmers spend 15-20 hours a week in the pool year round. 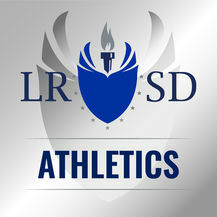 They are truly dedicated student athletes and LRSD is truly proud of them! Congratulations. Coaches and administrators describe J.A. Fair’s Kristeon "Kris" Bankston - a 6’7" senior - as a hard working student/athlete and a great kid on and off the court. It’s no wonder that he would be named this month’s LRSD Athlete of the Month. Kris is a member of the gentlemen’s club at J.A. Fair and is also a member of AVID and the War Eagles baseball team. Kris has committed to a full athletic scholarship to play basketball at the University of Arkansas Little Rock this fall. He is currently averaging a double-double this season with 13.2 Points per game, 2.2 blocks per game, 1.5 steals per game, and 11.7 rebounds per game. The LRSD family can’t wait to help you “pack the Jack” when you arrive at UA Little Rock, Kris! Parvkiew Magnet High School's Javon Franklin was named "Athlete of the Month" for December following his outstanding basketball season to this point. Franklin, a recent KATV "Full Court Awards" finalist, is a 6'6" senior forward, known for among other ball-handling skills, his tremendous rebound abilities. Describing him as a "complete player, Coach Al Flanigan refers to Franklin as his "game-changer." A member of the 2016 6A State Championship basketball team, Franklin has his eyes on either UALR or Fayetteville for his collegiate basketball career. For the month of November two outstanding female basketball players named co-athletes of the month. Central High School Lady Tiger Bre’Amber Scott was named All Conference (2015-2016), and Most Outstanding Player Ladies Hardwood Classic (2016). For the 2016-2017 season Bre'Amber is averaging 22 points per game while maintaining a 3.42 GPA for the first nine weeks. Bre'Amber has already verbally committed to attend Mississippi State University. Parkview Lady Patriot Sydni Williams is also co-athlete of the month. Sydni is known for dominating the inside by grabbing rebounds, blocking shots and making easy baskets. She has averaged 10 points, 7 rebounds and blocked 3 pointers in two games. Coach Green is expecting great things from Sydni this season and feels she is a tremendous asset to the team. McClellan High Middle Linebacker on Defense Ma'laizh Surrell was named the October Athlete of the Month. This year, he has had 46 solo tackles, 28 assisted tackles, 2 fumble recoveries and .5 sacks. His career stats at McClellan include over 200 solo tackles; he is 4-year player, 3-year starter and 2-year captain. He was captain at last year's State Championship bid against Pulaski Academy. Surrell is also and AP student with a 3.0+ GPA and is a member of the Crimson Lions Wrestling Team. Central High Kicker Jason Ronnel was named Athlete of the Month for Septermber. Ronnel's football stats as a kicker have generated recruiting invitations from the University of Texas, the University of North Carolina and the University of Texas. His stats in the classroom are equally impressive with a 3.9 GPA and score of 32 on the ACT. On the field he is 8-12 in field goal attempts with a long of 14, 17-17 in extra point attempts; he has completed 24 punts with 11 downed inside the 20 for a 39.6 average and a long of 59 and he is 25-31 with kickoffs for touchbacks. Parkview Track Star Jada Baylark and the Hall High Boys Soccer team were all named Athletes of the Month for May. Jada was named after winning first place in six events at the 5A State Track Tournament qualifying her to compete at the Meet of Champs; she won the 4x1, long jump, triple jump, the 100 and 200-meter dash, 100-meter hurdle events and also received high points recognition. 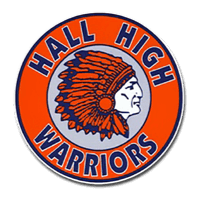 The Hall High School Boys Soccer Team members were also named Athletes of the Month for May after becoming Conference Champions with a regular season finish of 13-1. They entered the State Tournament as the #1 seed and competed at the quarter finals level. 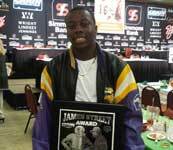 McClellan High School State Wrestling Champion Raymond Ivory is the LRSD's Athlete of the Month for March. Ivory recently won the Wrestling State Championship in the 220 class. Previously he placed 5th during his sophomore and junior years. He is a three-year Letterman in Football and Wrestling and was named to All-State this year in Football. In addition to excellence on the field and the mat, Ivory boasts a 3.0 GPA which reflects his commitment to academic excellence. He wants to play Football in college and is currently considering UAPB, Grambling State, SAU and Henderson State. Parkview Arts & Science Magnet stand-out boys basketball player, Ryan Pippins, was name the Athlete of the Month for February. His outstanding performance on the court has helped the team accumulate an impressive 8-1 record in conference and 19-3 record overall. Through 21 games, Ryan "Pipp" Pippins a points per game average of 10.3, 3 assists/game, 3.7 rebounds/game. This season, he has scored over 20 points in three games. Once again, Central High's Lady Tiger basketball star Kiara Williams has been named the Athlete of the Month for January. As a junior, Kiara was named the January 2015 Athlete of the Month and she continues to be a stand-out star and team leader. Earlier this year, Kiara signed to play college ball for the University of Arkansas at Fayetteville next fall. She has a 3.0 GPA and averages 13 points a game— proving that outstanding athletes have the discipline and dedication required to be successful in the classroom. Already her team is off to a 13-0 start and is ranked number one in the state. Significantly, Maxpreps has ranked the Lady Tigers #20 in the nation and USA Today has ranked the team as #25 in the nation. We have every expectation that Kiara and her team will have the right stuff to take home the 7A State Championship this year. 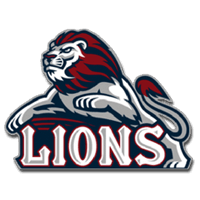 McClellan Crimson Lion Junior Pierre Strong, running back and wide receiver, was named LRSD's Athlete of the Month. Recent honors include: Arkansas Democrat-Gazette Player of the Week and Yarnell's Sweetest Play and standout performances all season long (10-2). McClellan entered the 5A State Championship Tournament as the number two seed for the 5A Central. After defeating Morrilton, Lakeside and Batesville, the Crimson Lions vied for the state title against Pulaski Academy. Although they didn't take home the title this year, when accepting the Athlete of the Month award from Superintendent Baker Kurrus and Deputy Superintendent Marvin Burton, Strong vowed to emerge on top next year. We are looking forward to another standout performance from Strong in 2016 during his final year of high school competition. Hall High School Tennis Players Ashley Gray, senior, and Caroline Gibbens, sophomore, were selected as Student Athletes of the Month after winning the 6A State Championship Doubles match. This is a back-to-back championship win for Ashley Gray, who also won last year's top spot with Jasmine Brown (class of 2015) as her partner. Their performance in the tournament also secured the 6A Runner Up slot for the team. Parkview Patriots Quarterback Koilon Jackson, a junior, was named Student Athlete of the Month for September. In 5 games he has 34 rushing, 806 passing, 1 rushing TD, 14 passing TD’s and 2 interceptions. Koilon was instrumental in the recent Parkview Patriot win over rival Little Rock Catholic (35-5). In addition to the important leadership role he plays on the team, Koilon is a solid student who volunteers at his dad’s center, P.A.R.K. (Positive Atmosphere Reaches Kids). P.A.R.K. 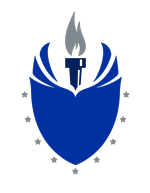 is a non-profit organization which was established in 1993 by Keith Jackson. The mission of P.A.R.K. 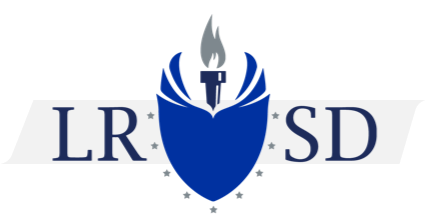 is to provide "high-risk" students the opportunity to further their education by completing high school so they can attend college. Little Rock Central Junior Nathan Abraham, Jr. was named LRSD Athlete of the Month for May. Abraham packs a powerful pitch and has helped the Tigers win many games but his accomplishments off the pitcher's mound are equally impressive. He is currently ranked 9th in his class and recently won the Sewanee University of South Award. He was recognized as the top AP student for U.S. Government, U.S. History, English Language and Composition and Human Geoography. He is a member of Junior Citivan, National Honor Society and Beta Club. He made All Conference and All State in baseball and received the U.S. Army Reservie National Scholar Athlete Award. Plus, he made a near perfect score of 35 on the ACT. The McClellan Boys Basketball Team was selected as Athletes of the Month for April after winning the 5A State Championship title after upsetting Maumelle in an 82-73 victory on March 14, 2015. They were also recognized as the 5A Central Conference Champions. Their overall record was 24-6 and their conference record was 13-1, averaging 74 points per game. Keith Hayes and Andre Jones were selected to the Arkansas All-State Team. Additionally, Keith Hayes, Raymond Harris and Andre Jones were selected the 5A State Playoff All-Tournament team. Andre Jones was the MVP of the entire tournament. Keith Hayes will participate in the Arkansas All-Star Game which will be held in Conway, Arkansas, this summer. The Little Rock Central High School Cheerleaders were selected as Athletes of the Month for March after winning the Cheersport National Championship title. The competition squad members are: Jade Benning, Andrekion Blevens, Hugh Burrow, LaWanda Chaten, Skyy Clark, Katie Clements, Bonnie Davis, Katherine Hale, Naya Harper, Hannah Headlee, Nia Jackson, Nijaiha Jackson, Bria Khabeer, Hannah Lewis, Porter John, Norah Jones, Lauren King, Christian Pride, Jasmine Sewell, Sydney Steele, Adrianna Stewart, Johnna Summons, Payton Williams, and Addison Yee. Worthie Springer, a junior at Arkansas School for the Blind and Visually Impaired, was named Athlete of the Month for outstanding achievement on the Parkview Magnet High School Swim Team. He also is a member of the Parkview Debate Team. 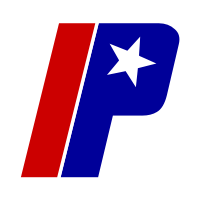 Three other Parkview athletes, Markell Foreman, Braelon Walker and Jaylen Franklin, were also selected for the honor but were recognized in March. Markell Foreman (pictured) is the epitome of scholar-athlete. He is currently ranked 17th in his class with a 3.93 GPA and scored 27 on the ACT. Basketball players Braelon Walker and Jaylen Franklin were recognized for receiveing basketball scholarships to Missouri Southern State University and Abilene Christian University respectively. 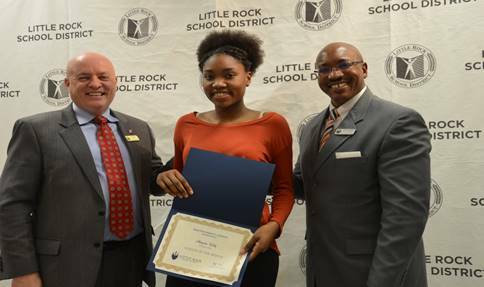 Central's Lady Tiger Basketball player Kiara Williams named LRSD Athlete of the Month for January 2015. When her parents told Little Rock Central High junior Kiara Williams to shoot for the moon, she did. This talented young basketball player has represented her school and team well, earning the highly coveted Downtown Tipoff Club's Arvest Outstanding Player award. A 6' forward, Kiara is a well-respected member of Central's Girls basketball team, averaging 14 points per game and giving her the distinction of being one of the best players in the state. 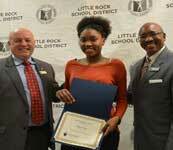 She can now add the designation of being named LRSD Athlete of the Month for January. Kiara's aspirations include being successful in life - "whether it is in basketball or coaching." She says, " I want to be that player who younger kids want to play like." Basketball Player Keith Hayes, a McClellan senior, was recognized as the “Athlete of the Month” in December. Through nine games, he led the Crimson Lions in scoring with a 25-point per game average. 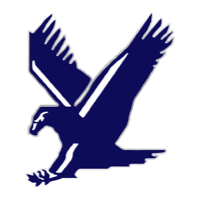 Hayes is the recipient of a full athletic scholarship to The University of Massachusetts Lowell, where he will continue his academic and athletic pursuits. Jasmine Brown, senior; and Ashley Gray, junior, from Hall High School, were the first student-athletes recognized. Brown and Gray won the 6A Girls Doubles State Tennis Championship. The win helped secure the Overall Runner-Up State Champion title for the team. Significantly, Brown is also ranked number 1 in her class academically.